Shabbychick Junk. 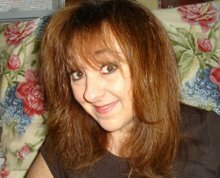 : What was I thinking? Do you guys ever dig through your piles of patterned paper and come across paper where you think "What was I thinking when I bought this paper"? That was the case with this green polka dotted paper, (which will remain nameless). I'm sure it had a ton of beautiful coordinating papers with it, which I failed to purchase, so I had one lone piece of this green, no match paper sitting in my file. I decided that instead of hating on it, I'd try to use it up and see what I could do with it! These cards are what followed! 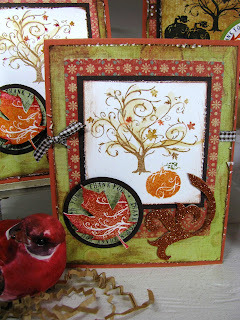 I decided that the rusty polka dots in the paper would go great with fall cards, so I added some rust floral paper to it and stamped a fall tree & pumpkin for my focal image (Inkadinkadoo set from Michaels). I actually do like how they turned out; they look rustic and fallish and I needed thank-yous for my work stash in the worst way! Oh, I forgot; one more thing, you'll be seeing these little flourishy chipboard swirls on lots of stuff! It's my newest obsession! More to come! This is so very awesome!! WOW!! TFS!! I have that stamp set too and after seeing your BEAUTIFUL card, I want to go make something with it! Thanks for the inspiration! Totally adorable. You really rocked with the design. I have a whole bunch of "ugly" paper that I bought for some strange reason. You disgused yours well. They turned out great and I love the flourishes! 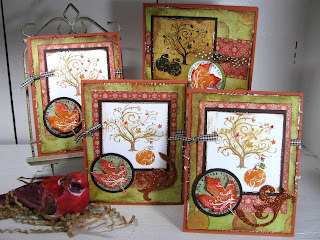 I love the fall cards you made, and now I must find that tree stamp! One can never have enough trees, or tree stamps! What gorgeous cards! I couldn't find the ugly green paper with the polka dots. It's perfect for these cards! Awesome!